Cosmotron® DPU-AC powder admixture for cement and plaster bound composite products and materials. Cosmotron® DPU-AC is a safe-to-use, non-air-entraining, normal set, ‘instantly’ dissolving 100% solids powder admixture and cement improving product. Specifically, it is a high performance surface active dispersing agent for the cementitious binding material of and super water reducer for poured-in-place (‘wet mix’) concrete, mortars, engineering grouts, cement and /or lime wall renders, gypsum / lime plasters etc, required to be made with less water for the same consistency, compared with non-modified plain mixes, to result in normal slump consistencies. As such, it increases mechanical strength (and the water, chemical, weathering and abrasion resistance) of these materials when fully hardened. In addition Cosmotron® DPU-AC is a flow inducing agent (‘super plasticiser’) or viscosity lowering modifier for these wet mix materials typically made with normal water contents. Cosmotron® DPU-AC Powder is most suitable for use with ‘semi-dry mix’ concrete products manufacture - those made with ‘Besser’/’Columbia’ type machinery for manufacturing concrete masonry, pavers, crib/’lock’ blocks etc , as well as for the manufacture of spun concrete pipes, compacted sand / cement product mixes and extruded concrete roofing tiles. These beneficial effects result in better extrusion properties and better unset ‘moulding’ mix consistencies as well as more efficient cement dispersion. Cosmotron® DPU-AC therefore results in these products after setting, efficient curing and subsequent hardening having increased mechanical strengths, reduced porosity / permeability to liquids with increased density, abrasive wear, water and efflorescent salt bloom resistance. • Water reduced (ie water content cut by 20% - 25%) wet plastic poured-inplace slump type consistency concrete, having normal setting time and together with the provision of a proper curing procedure (mix water retention after finishing), for easily obtaining increased early and ultimate strengths, hardness, impact abrasion resistance and greater cracking resistance - ensuring greater long-term durability with minimal maintenance costs for these hardened materials. • Non-bleeding, easily placed poured-in-place plastic concrete having considerably less water for a given consistency or slump to eliminate the formation of cement scum laitance and subsequent dusting on the surface of the hardened concrete to result in increased serviceability, resistance to wear, erosion and weathering as well as better quality and more uniform finishes, colour/texture uniformity and general aesthetics. • Increased bond, shrinkage resistance, chemical resistance and, with the placement over steel reinforcement of adequate concrete cover, increased corrosion resistance by means of providing lower permeability, lower water:cement ratio concretes / mortars / plasters for the same consistency - thus eliminating future costly maintenance of these materials in their hardened form. • Non-set-retarded, normal set time ‘wet-mix’ plastic concrete and mortars (with about 20% less water for the same slump at a given concrete temperature) for easier site placement and trouble free screeding, floating and finishing. Also, for higher early strength - particularly strengths between 10-24 hours after setting - for earlier removal from moulds of concrete products or mould stripping from concrete sections. • Improved pumping qualities of low slump plastic concrete with improved handling characteristics and reduced re-bound in water-reduced shotcretesprayed concrete/mortar mixes - thus achieving hassle-free site handling, application and perfect results in place every time. • More watertight hardened poured-in-place concrete, masonry mortars, applied exterior cement wall renders, internal solid wall plasters and all types of concrete products having less corrosion potential to steel reinforcement together with lower shrinkage and creep (deformation of concrete under load) potential to result in long-term dimensional stability. These benefits are obtained by adding Cosmotron® DPU-AC powder to prepared wet plastic pre-mixed 40mm slump plastic concrete, re-mixing in the transit truck at the mixing barrel speed (20 RPM) for 10 minutes to typically result in normal 80mm slump plastic concrete for easy, normal placement and easy efficient site handling and processing - including the important compaction procedure by means of suitable concrete vibrating tools. • Brighter, stronger and more uniform colours for integrally through coloured barrel mixed concrete, concrete products, brick mortars, cement renders etc. with the use of Ability’s ultra durable abilox® rapidly dispersing finest colouring oxide pigments in both pourable (slump) and semi-dry (no-slump) type concrete mixes (through better pigment particle dispersion) in lower water content mixes for UV resistant permanent colouration and happier clients and owners. • A uniform finish for normal grey (unpigmented) poured-in-place off-form concrete products structural concrete members etc with less water for the same consistency and slump and, with the provision of adequate vibration / compaction, a more even uniform appearance with less off the form ‘bug’ hole air bubble surface voids for improved surface finish quality and appearance. • Cosmotron® DPU-AC modified and therefore water reduced wet plastic poured-in-place concrete has a lower tendency to segregate because of its improved cohesiveness. Cosmotron® DPU-AC results in other improvements such as easier placement and easier compaction by vibration and easier, speedier finishing, ie: the speed of handling is definitely improved allowing easier, trouble-free site processing. • Improved, easier-to-apply cement-based stucco, bagging mixes, other cementitious coatings, cement renders and applied wall finishes as well as decorative floor toppings / screeds / granolithic (‘grano’) factory floor topping mixes etc. - all with technically recommended less water to result in lower water to cementitious ratios in comparison to the cementitious binder content to ensure the highest strength development. • Complete compatibility with virtually all other chemical admixtures for concrete and mortars such as normal water-reducers, set time accelerators and retarders, white salt bloom efflorescence and permeability reducing admixtures, flexibilising resin polymers, silica fume etc ensuring, with the correct site processing steps, trouble-free results of the highest excellence. * For the most efficient and easiest way to cure concrete by preventing the mix water from evaporating - to ensure full strength development and wear resistance, Ability offers its Duro-Seel Clear liquid curing compound coating. This can be easily applied by soft broom, paint brush, long nap roller or suitable spraying equipment. Please request further printed information. • Improved stronger concrete products with good looks - lower blemishes, higher uniformity of texture or smoothness, higher hardness and density, higher early / ultimate strength and abrasive wear resistance for greater market acceptance. • Highly flowable poured-in-place “wet-mix” concrete if required by using Cosmotron® DPU-AC with a normal water content. Flowable concrete results in less placement, compaction, vibration, handling times and costs. However, to ensure that the design strength of the concrete is achieved in place, all grades and classes of concrete should be densified by adequate compaction by means of a vibration process to remove all air bubbles/voids. • Cosmotron® DPU-AC is easily dosed by weight - manually or with automatic free-flow powder flow metered dispensers (or weigh batching) in its exceptionally free-flowing 100% solids powder form - we do not sell water! This product can also be re-dosed into previously mixed Cosmotron® DPU-AC dosed plastic pre-mixed concrete if required to maintain slump-and workability to obtain increased handling time flexibility during concrete placement/discharge. Also concrete, mortar and other cement bound mixes may in some cases be delivered to the site dry - without water - if required in transit mixers. 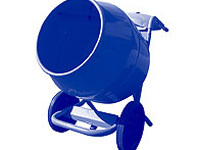 Water (about 20% less than if Cosmotron® DPU-AC is not used) can then be added if available on site and mixed in (for 10-15 minutes at the transit mixers mixing speed) at the convenience of the purchaser or concrete site processor/ finisher. • The product also allows for shorter but necessary prior pre-set times to be used for elevated temperature and humidity curing schedules such as with the use of steam curing with reduced energy consumption at a given temperature for lower cost-to-make, factory cured, water reduced ultra-high early strength pre-cast concrete panels, concrete pipes and other concrete products. • Cosmotron® DPU-AC powder grade super water-reducer and flow agent supplied by Ability has a very long shelf life and does not normally deteriorate on storage - provided that the degradable Concrete-Friendly® sacks in which it is packed are stacked on pallets, off the ground under cover - thus preventing loss through wastage. • A set-retarding version of Cosmotron® DPU-AC may be made available on firm, advance order if required for longer, more ‘open’ and flexible site handling time to avoid mistakes occurring through rushing. • Cosmotron® DPU-AC 'instantly' dissolving powder added to make water-reduced poured-in-place concrete allows worthwhile reductions in cement contents to therefore reduce subsequent shrinkage, cracking and creep potential. This option provides long term dimensional stability and integrity for the structure. However, for durability considerations, an adequate cement or cementitious content to result in concrete having a minimum of 32Mpa compressive strength at 28 days in place, is in most cases considered necessary. • Being a free-flowing, easy-to-use powder, Cosmotron® DPU-AC can be added into formulated factory compounded cement and/or lime / gypsum plaster based ready-to-use dry-mixes of all types - for ease of product use and quality results due to the lower water contents - which will tend to be automatically used by the operator. If Cosmotron® DPU-AC is used in poured-in-place (slump) concrete, mortars etc. to reduce the water content at a normal or given slump please take note that approximately 40 minutes after making the concrete, at a concrete temperature of 25°C, it will rapidly lose slump (consistency) and be reduced to the slump applicable of a plain, unadmixtured concrete at the reduced water content. However, this lower slump plastic concrete can be re-dosed with Cosmotron® DPU-AC powder and adequately re-mixed to increase flowability and regain the original slump, if required. This re-dosed concrete should then be placed, site processed and finished rapidly. This loss of slump effect (increase in viscosity) will happen even more rapidly at higher temperatures. Cosmotron® DPU-AC admixtured concrete at an 80mm slump will revert, within a relatively short time, depending on the concrete temperature, typically to a slump of 30 to 40mm. Therefore it should be placed, compacted by vibration and finished within 30-40 minutes approximately of manufacture at this temperature if the maintenance of an 80mm slump is required for these operations. The suggested starting point dose is 0.4% by weight of total cementitious content by weight. This equals 160 gms per nominal 40 kg bag of Portland cement or 0.4 kg (400 gms) per 100 kg of cement or cementitious material.